This gorgeous personalised handmade new baby card features an image of a pretty ornate pram and is finished with jeweled flowers and a hand tied satin bow. You can personalised this new baby pram card to congratulate the new parents or grandparents, the list is endless with our fully customisable cards. 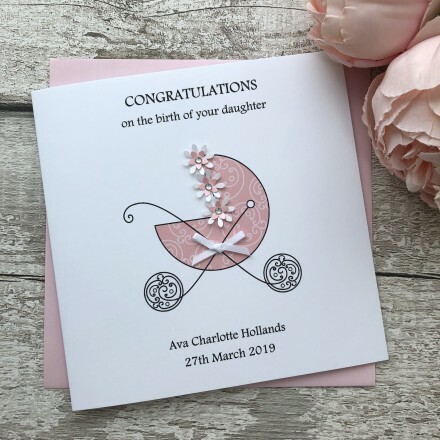 This handmade new baby card is teamed with a matching envelope, protected in a sealed cellophane bag and sent to you in a double board outer envelope to ensure it arrives in pristine condition.